Guess what I’ve been working on? My first Moda Bake Shop project – and it’s up today! I used the new Chrysalis collection by Sanae. (Remember this pile?) Some great prints. I love Sanae. If you’ve been around a while, you already know my Arcadia love. This is kind of a BIG quilt. About 84″ x 84″ – but it comes together really quickly for a bigger project. The fabulous quilting on this quilt was done by my friend and co-worker at American Quilting in Orem, Utah, Becky Heslop. She did an AMAZING job. Thanks again Becky! If you’re local, the quilt is hanging at AQ right now. And a limited number of kits will be available at American Quilting soon. Head over to Moda Bake Shop to see the tutorial. I would love to get your thoughts, feelings, vehement opinions, violent reactions, whatever you’ve got for me. Fabulous quilt!! Off to MBS! Soooooo Cute! Love it and I love BIG quilts. So happy to be back to back with you at the Shop! Awesome project, nice and big, beautiful, and so doable to assemble. You are great, love your blog! Thanks for the fabulous tutorial! this is beautiful!!! i am off to go check it out on the bakeshop sight! This is a very striking quilt! I love the fact that it&#39;s big, but looks like it will work up very quickly. Thanks for sharing – I&#39;m off to MBS!! I absolutely love this quilt! Its perfect to showcase those larger pieces of beautiful fabric. The quilting is also amazing! I want to make my youngest son a quilt using charm squares set on point, so I&#39;ll definately be refering to this tutorial. It&#39;s beautiful. Great job! I love that design! I am slooow-ly working towards a quilt of baby clothes and this would be a nice way to showcase the blocks–and to not have to make too many. I appreciate all of the tips and tutorials. My violent opinion is that I wish I was still your neighbor so that you could be my personal quilting guru. But alas . . . I&#39;ll have to settle for admiring through cyberspace. And congrats on the MBS slot! You&#39;re so worthy! Saw the MBS post before I got to your blog post today. Love it!! Already printed it. The solid you chose makes all the colors of the line pop. I just received some Chrysalis in the mail. This line is fabulous and I will definitely be ordering more. Keep up the good work! Oh, it&#39;s fantastic! I was hoping Chrysalis might have the same feel as Arcadia, and it does! I&#39;m off to check out your tutorial! Amy it&#39;s great. Congrats. And I share your Arcadia love so the coloring is perfect! Congratulations!! The quilt is so pretty – ANOTHER bookmarked MBS page for me to work on someday! Well, I LOVE it!!! I already have a Chrysalis layer cake, looks like this could be the perfect recipe for me 🙂 Just need a charm pack to get started! LOOKS GREAT! I love that it is a big quilt. I love Sanae and Arcadia too. I plan to love this new line just as much. I absolutely love it. Great job!! I really love the back part too. That&#39;s awesome! I just ordered the charm packs and jelly rolls of Chrysalis, unfortunately, not layer cakes though. But I DO have Stone in stock! Yipee! Glad to see I have something that goes with it so beautifully. Its about time they had you do a pattern! Love the back! Love the quilt, and congrats on being a MODA chef. I need to find me a good quilter, it makes all the difference. Wow, I absolutely love this! Hopping over now to check out the recipe . . .
Love love love. It turned out beautifully. 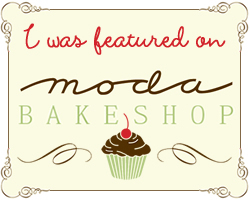 How fun to be part of Moda Bake Shop. Love their blog too 🙂 You should be there! I am so proud of you! I saw this quilt up at the shop this last Saturday and was admiring it! It&#39;s gorgeous Amy! That is the perfect fabric for it – wish I had enough Arcadia to make it!! Love love love your quilt. The gray is perfect. LOVE! so happy to see you there! it&#39;s about time! What a beautiful quilt! The color scheme and use of fabric is really great, and the overall effect is amazing!